You don’t usually have to wait very long before I post a photo of (or, sometimes, in) a parking garage. I have a weird fascination with them, which predates last year’s escapade with the Rude Canadian. But it is very likely that every single parking garage image since then has been a bit of a photographic middle finger for that guy! Posted on April 21, 2016, in Photography and tagged 365 photo project, black and white photography, downtown, Leica, melinda green harvey, monochrome, one day one image, Phoenix, Phoenix Arizona, photo a day, photography, postaday. Bookmark the permalink. 10 Comments. I’m all for the Middle Finger when it comes to self-important morons. (The German term for this is der Stinkefinger, which I think is completely hilarious). Well… perhaps the trouble you’ll get in would be mitigated if you taught her the proper declension too? I’d probably (on accident, mostly) teach her to say “der Stinkefinger, y’all” with a bit of a West Texas twang. That’s how it is around here. 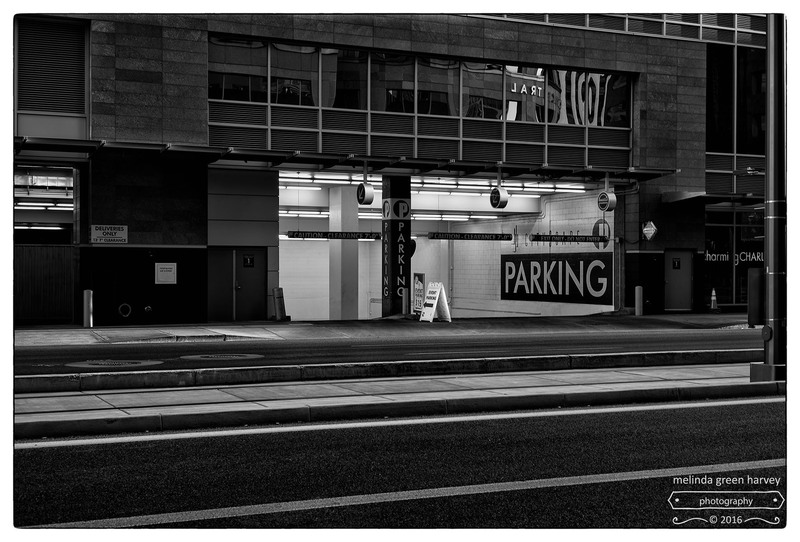 Clever shot..off street parking with street !! Thanks – I enjoyed composing the shot to get both of those things in it. Glad you got my little joke! Fine find. Looks like business may have been slow. I was sort of surprised at how little traffic (foot/transit/cars) there was in downtown Phoenix. Maybe I was there on the wrong days? Or the wrong times of day? Or, maybe, it’s just not that busy. The exception was when I rode the light rail on a Sunday afternoon – the train was packed!